We are here to help you enjoy your life by helping you to look and feel your best! To make a convenient appointment, simply call us today. Our practice is dedicated to helping our patients recover from all types of injuries and surgeries. Our goal is for you to get better and back to your normal activities. At Partners In Physical Therapy, we want to maximize your time with us. Prior to your first visit, please print and complete the New Patient Forms below. Please bring these completed forms, your insurance cards, and photo ID with you to your first visit. Otherwise, please arrive 20 minutes prior to the start time of your appointment. This will allow the extra time needed to complete your new patient forms. Make a list of questions and concerns you would like to discuss with your therapist. Please call our office to learn how you can help verify your insurance benefits. During the evaluation your therapist will ask questions about your medical history, current pain, or injury. 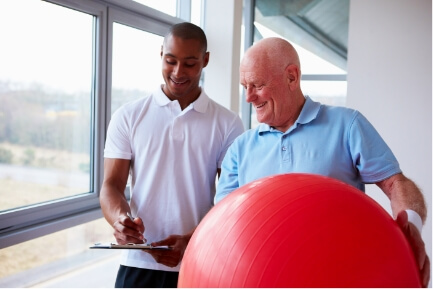 Your physical therapist will also answer any questions you may have about therapy and your condition. Open communication helps us get you better. Your movement, strength, coordination, and much more will be evaluated. Our purpose is to help you, so please communicate to your therapist if anything is hurting or bothering you during the examination. You will schedule a series of visits with the front desk. The amount of therapy needed will be discussed with you, depending on the recommendations of your therapist and physician. We offer many convenient appointment times. You will meet with your patient advocate. Her job is to make sure that you feel well taken care of and that all of your needs were met. In addition, she will help to ensure that you know that you are assigned a patient advocate as a key contact to reach out to with any concerns, questions, or compliments.